Marina Cabo San Lucas is a stylish port where along with people watching, you can even letch at the yachts that are parked here. The area is full of restaurants and cafes and is always bustling with colorful crowds. Great place to sit around and watch the world go by, the marina has a lot of good options for shopping too. This is also the place where many boats are available for excursions to the nearby islands. Watch out for street vendors trying to sell you trinkets. They could be a mood spoiler. How popular is Marina Cabo San Lucas? People normally club together El Arco De Cabo San Lucas and Arte De Origen while planning their visit to Marina Cabo San Lucas. 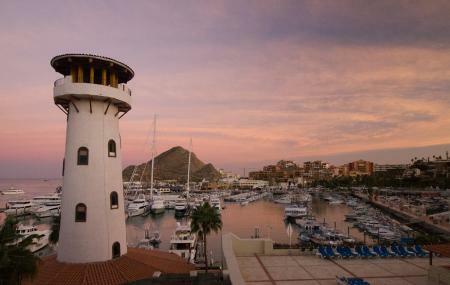 People also prefer to start their day with Marina Cabo San Lucas. Amazing quality in the service, the food was amazing, such a nice experience in here, happy with the attention they gave us! Great view, drinks are super reasonable if not cheap, awesome staff. They are even eco friendly and use paper straws! This is a new regular spot. It was a very nice experience been in here, I enjoy the service a lot, the food is amazing in here, the quality of the service is great. This is a very nice place to hang out and have a nice dinner, I recommend this place a lot.